Follow these simple steps and that ideal property in Egypt will be yours. Before you fly out to Egypt, spend plenty of time researching the market online. Go through all of the information in the Egyptian section of this site and then start looking for developers, agents or individual properties that look as if they might be interesting. The Egyptian Listings section of the site is probably the best place to start your search, but also check out the advertising in this section, and look at the Directory to get some more contacts. Although it is possible to arrange financing in Egypt through a Egyptian bank, it is not as easy as in many of the other markets that we cover on Propertastic! and the terms aren’t so great either – it is only possible to obtain mortgages in Egyptian Pounds (not the world’s most stable currency) and interest rates are very high compared to those in Europe. As a result, you will probably find it a lot easier to obtain financing in your home country, perhaps by re-mortgaging your current property or properties. Another option is to discuss the possibilities with a mortgage broker who is based in your home country and has experience of arranging mortgages on property overseas. Beware though that, as Egypt is such a new market for international property buyers and is considered as being less stable than the usual favourites, it might be difficult to find a lender who is prepared to lend on Egyptian property. that the maximum amount you are able to finance is EUR50,000, your time will have been wasted. There are currently no regular budget routes to Egypt and so you will probably need to fly using one of the major carriers such as British Airways or EgyptAir (expensive) or by charter flight (probably the cheapest option). Once you have flight and accommodation arranged, head out there to look at those properties that look most interesting for you. Check the properties, or the locations if you are looking at an off-plan property. Don’t just check the properties themselves; check out the areas that they are located in as they will all be new to you. Ask plenty of questions. What kind of tenants are you expecting to work with? If you are looking for short-term tenants (i.e. tourists), then you are going to need something very close to the centre if you are planning on buying in Cairo, or to the beach if buying in one of the resorts. Are there some good hotels close to the property? If so, you’re looking in the right place. If you are looking for long-term rentals, then make sure that it is in a desirable part of the city, if not the centre. Ask yourself the question, “would I like to live here?” If the answer is no, then chances are that the up-market tenants you are planning on renting the property will also not be so keen. If you are going to be buying an off-plan or a newly built property that has not been occupied in the past, you might be able to get away without employing a lawyer providing that you have someone else to help you through the process (like a good real estate agent or a developer – providing that you really trust them), but having a good English-speaking lawyer specialized in real estate representing your interests is still highly recommended. However, if the property has been occupied in the past, then you definitely need to employ the services of a qualified lawyer or else you are definitely in dire danger of running into some major problems further down the line. This is because, unlike in most territories that we cover, there is no Land Registry which lists ownership details of all property in the country, currently only around 10% of property in Egypt has been officially registered, which is perhaps not surprising considering that fact that, until it was recently reformed, the process required 77 bureaucratic procedures at 31 different agencies, which could take 6 to 11 years to complete. From a practical point of view, buying a brand new or off-plan property is really the only way to go in Egypt at the moment. The risks associated with buying an old property are probably just too great for this to be considered a viable option. In order to purchase property in Egypt, you need to obtain a residence visa. This is something that is a formality for your lawyer to arrange, even if you are not planning on spending much time in the country and will be issued for a period of three or five years. As it is vital that you find a lawyer who is representing your interests and your interests alone, don’t ask the real estate agent or developer to recommend one – it’s better to choose one yourself. You can find details of Egyptian Lawyers in the directory section. One other advantage of using a lawyer is that, by giving them ‘Power of Attorney’, they will be able to sign legal documents on your behalf. This can offset some of the costs if it means your having to make one less trip to Egypt in order to complete the buying process. If you do decide to employ the services of a lawyer, reckon on paying around EUR500-600 to them. Everyone knows that, if you go to a market in Egypt, you never accept the first price you are offered for that carpet or amusing hat – you are expected to haggle and the initial price will reflect this. The prices of property in Egypt varies a great deal and so be prepared to do some haggling of your own, before you come up with a final selling price that is acceptable to both you and the seller. This situation only applies to resale property – off-plan properties from major developers will tend to be priced realistically and there is little room for negotiation here. Make sure you know exactly what costs are covered in the final selling price to avoid any nasty surprises further down the line. Typically the seller will be responsible for paying the fees of the real estate agent, which is usually in the region of 1.5%. All other costs are typically paid by the buyer. If you haven’t already arranged financing in your home country, you need to arrange it locally. If you’re going to be buying off-plan, then check with the developers to see if they can recommend a local bank. If not, you’re on your own. Check out the links to Egyptian Banks in the directory section. The process of obtaining a mortgage in Egypt from a bank is going to be similar to that in your home country. They are going to see some proof of income before committing to a loan, so make sure that you bring all of your important documents with you to a meeting with a bank. Expect to have to wait for a minimum of a week or two in order to get a final decision from the bank, perhaps longer. This will need to be signed in front of a notary. Typically, your lawyer will have several weeks to check the Title Deeds if any exist for the property. If there are none, and the property is not listed with the Real Estate Registration Office, your lawyer will need to search the legality of the property and the owner’s rights to sell it in depth before you are even able to get to the stage of making an initial contract. Your lawyer will then be able to register the property with the Real Estate Registration Office, a process which can typically take around four months. Make sure that this is sufficient time for you to have all of your funds in place to complete the purchase because, if you aren’t ready to complete the purchase on the contracted date, you could very easily lose your deposit. While your lawyer is checking the status of the property, you will now have a certain amount of time to inspect the property. Note that Egypt doesn’t have to comply with EU Building Regulations and there have been reports of some very dodgy construction techniques being used in some developments. You should consider getting a surveyor’s report done if you have any fears at all to save you a lot of grief down the line if the construction is sub-par. Budget on spending around EUR250 for a thorough surveyor’s report on a property. If you’re buying off-plan, ask the developer what guarantees they are willing to give on the property. You can find details of Egyptian Surveyors in the directory section. The final contract is signed once your lawyer has carried out all of the necessary checks and searches by checking the Title Deeds if there are some already in existence getting new deeds created for those properties that have not been registered in the past. To complete the purchase, the buyer of the property needs to pay (equivalent to Stamp Duty). This used to be equal to 3% of the property’s value, but is now a fixed sum, which varies according to the location of your property. The maximum amount that this will cost is currently EGP2000 (EUR260). You will also need to pay a small inspection and measurement fee, of approximately EUR65. Another restriction on foreigners' buying property in Egypt is that it is currently not possible to buy any property in Sharm el-Sheikh, or anywhere else on the Sinai peninsula, on a freehold basis. Instead the only option is to buy property on a leasehold basis, with a maximum duration of 99 years. 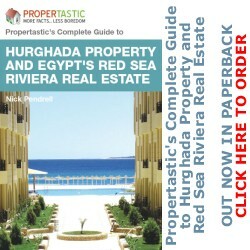 These restrictions do not apply to property bought in Hurghada or anywhere else on the western side of the Red Sea. The way to get around these restrictions is to register your ownership with a notary, which costs around EGP2000 (EUR260). This confirms your ownership of the property, but it does not add your name to the Land Registry, which means that you are free to buy as many properties as you like and you can also sell your property at any time you would like. As a result, this option is probably going to be the better of the two. Congratulations! You’ve just bought yourself a property in Egypt! That wasn’t so difficult now, was it? !